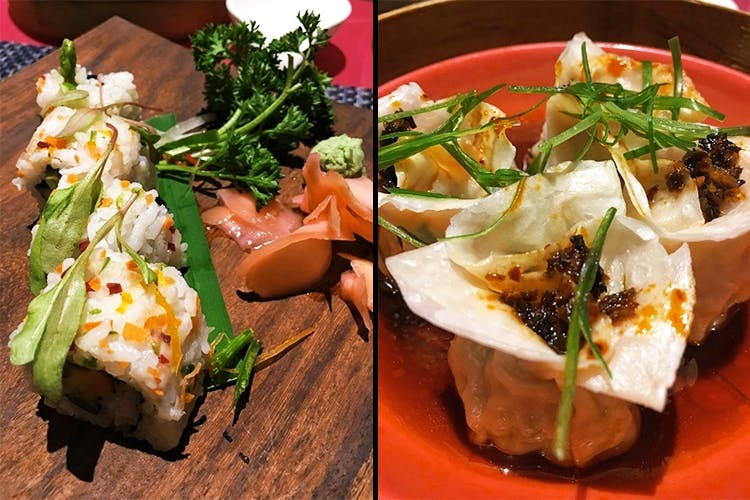 Beyond the ever popular indulgent lunch buffet, Asia 7 also does excellent dim sums, freshly rolled sushi and hearty main courses. Small plates are the best way to sample a plethora of diverse flavours, and Asia 7 does these with great panache. The sushi rolls are on point, and we specially love the Asparagus Avocado Roll that pairs crunchy asparagus tempura with fresh cucumber and creamy avocado. Fish lovers will enjoy the very colourful Salmon and Prawn Tempura rolls that offer a different flavour experience with every piece. The range of dim sums is exquisite and will dazzle with great effect. Herbivores should pick the Crunchy Almond & Broccoli or the New York Cheese and Chilli Oil, which contains molten cheese that explodes in your mouth and gently mingles with a fierce chili kick. For meat eaters, look beyond the obvious, and discover innovative pairings. The Prawn in Hot Yellow Curry is sensational- the sweet of juicy minced prawn balanced with piquant curry flavours. The Chicken & Water Chestnut Dumpling is dressed up quite dandily and plays with the palate with even greater style. For mains we suggest you take it easy, and get the Wok Tossed Water Chestnuts, Pok Choy, Tofu & Cashewnuts- green, nutty and very light. For an even healthier entrée, get the Steamed Fish with Young Ginger and Soy. Beautifully balanced and melt in the mouth, this is comfort in every bite. Don’t forget to end the meal with a pot of fine Jasmine tea. Savour the fine flavours of the Orient at Asia 7, that promises a meal which is playful, diverse and bursting with goodness and fresh flavours.